With more births and fewer deaths, Kazakhstan has achieved stable population growth after a period of decline. Maternal mortality has fallen dramatically and there is nearly universal skilled attendance at births. Gaps in access to contraceptives remain, however, and young people lack adequate sexual and reproductive health services. 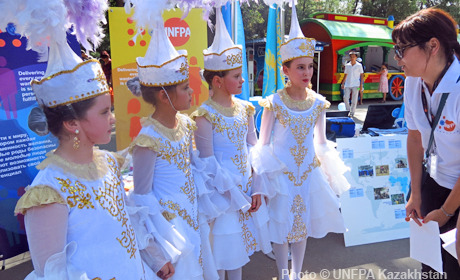 UNFPA began supporting Kazakhstan in 1992. Today, it provides expert advice and helps the Government and NGOs develop capacities to ensure that motherhood is safe, that family planning is available, and that all women and young people can access high-quality sexual and reproductive health care. The last 12 months, designated as the International Year of Youth, have been busy for youth activists and advocates.